In a continuing effort to keep you updated about our Tools & App sections we’ve interviewed Jamie, the developer of iScope & aScope. Jamie Higgins: Hi Warren, thanks for having me! warren karp: We’re talking today about both aScope and iScope you’re the developer correct? Jamie Higgins: They are mobile apps designed to give a quick, easy to navigate view into your SharkScope data and optimized very much for use on the small screen of a phone. warren karp: Poker players Brag? LOL…but seriously you can really look up any screen name that you want correct? Jamie Higgins: Yeah the apps work by allowing you to add your own poker accounts, your friends and then any other players (in these three independent categories). One of the neat things it does is aggregate all your own accounts to one overall view, so players with several accounts can easily see their overall results. warren karp: Great now Jamie do you also play live poker tournaments? Jamie Higgins: I’ve played a few live tournaments in the UK, but nothing to major. The biggest was a UKIPT series event (£250 buy-in). Jamie Higgins: Exactly! If that guy (or girl) next to you is telling you about all their big wins it would be nice and quick to look them up with the app. warren karp: I’m sure this version is similar but not exactly what you first came out with….what were the things poker players wanted to see most? Jamie Higgins: I think the most important thing is usability, as a mobile phone application it has to be simple and quick to operate and the graphs and figures easy to read and interpret. Jamie Higgins: I had a lot of requests for the iPhone version to add filters, so this is an additional feature in the iPhone. Unfortunately it was pretty complex and time consuming, so the feature hasn’t made it into the Android version yet. warren karp: How does the usage work on the app as far as searches and advanced searches? Jamie Higgins: It’s pretty simple each time you search for a players stats, update a player or look up tournament results etc. you will use one search from your daily allowance. The application caches all the data locally, so its possible to use the application and look-up all your stored data without using any more searches. Jamie Higgins: The apps require a SharksSope subscription to function. At the moment each app comes with a free 200 search package, which will shortly be changing to a free one month bronze subscription. warren karp: Great so plenty of opportunity to “Scope” out your opponent! In a world where information is king it certainly seems like this is a tool you can’t do without. Anything more to add Jamie? Jamie Higgins: I think that is a fairly good summary. I’ll just add that you can get the apps from the iOS App Store or from Google Play by searching for iScope and aScope respectively. warren karp: And of course in the new “Tools & Apps” section on the SharkScope website. Jamie Higgins: Great thanks once again for having me and good luck to everyone in their next tourney! Today I get to interview Anton, developer of the newest poker software that helps you with one of the most important parts of your poker skill set, Table Selection! SharkyScanner Anton: I’ve been playing since 2007, mostly HU SNGs. SharkyScanner Anton: Actually, in those days i didn’t even think that i may need some poker tool to help me win. But the more i played the more i realized that all these tools really work and bring you money. So I’ve decided to create my own software that could significantly increase my ITM. warren karp: ITM for the readers is? SharkyScanner Anton: Or replace with “winnings”? warren karp: Great so that was the birth of SharkyScanner, what year was that? SharkyScanner Anton: Started to make it in 2012 maybe. I used it for about one and half year and even didn’t think to open it for public. warren karp: Programming sounds like a passion to you, did you feel like this was a need in the industry or was it originally just something you thought would help you? SharkyScanner Anton: As I said before, at the beginning I used it just for myself and had no thoughts to share it with anyone, because it helped me a lot. And sure I realized how helpful it could be for many players. SharkyScanner Anton: The main feature is the search of weak players. You just say SharkyScanner what kind of players you want to play with and it searches those players for you. It can be used for searching empty tables as well, which is useful for HU SNG players. SharkyScanner Anton: SharkyScanner requests a lot of stats from SharkScope, so users can select any needed stats to decide who’s weak. The most useful stats are ITM, ROI and Ability score in my opinion. SharkyScanner Anton: That’s right. Currently SharkyScanner supports any SNG games, the only condition is that player list containing nicknames must be visible in the lobby of a poker client. SharkyScanner Anton: Yeah, without SharkScope it would be impossible to make this software. Since all major bugs have been fixed we don’t get many letters, ha-ha. But I’m really happy to get letters where subscribers say they really like it, ha-ha. SharkyScanner Anton: Right, I really don’t know any other software that can do this. warren karp: Would you say it’s a SNG tool or both SNG and MTTs? SharkyScanner Anton: Currently SharkyScanner doesn’t support MTTs because there is no player list in lobby for this kind of tournaments. But! I plan to make support for MTTs soon. SharkyScanner will just open tournament lobby and read nicknames there. warren karp: That would be a great upgrade, I also notice that right now it tracks both PS & FTP is there any plans for expanding to other networks? SharkyScanner Anton: Now it works just with PokerStars. FullTiltPoker and Ongame rooms are supported too but temporarily unavailable due to testing purposes. It will be available in few weeks. And sure I will do my best to make SharkyScanner support as much networks and rooms as possible. warren karp: Now that you’re listed and available in SharkScope’s Tools and Apps section have you found that the word is getting out and that it’s in more players arsenal? SharkyScanner Anton: Yeah, most of our subscribers found us there. Thanks to SharkScope guys! warren karp: Well that’s great to hear, is there anything else you’d like our readers to know? SharkyScanner Anton: Just want to say that everybody can try how powerful SharkyScanner along with SharkScope is! Visit our site http://sharkyscanner.com, get free 7-days full-featured trial and go for finishing, ha-ha. SharkyScanner Anton: Thank you Warren, hope to meet and talk again when we have some brand new features and offers. marc: TPE and Sharkscope have both been very important in helping me grow as an online poker player. Playing is obviously very important, but studying off the felt is also very key in becoming a top notch poker player. Early in my career I was a sit’n’go specialist and SharkScope made it easy to spot the fish. Knowing who is beating the game and who is giving away their money is a huge advantage going into any game. TPE helped me plug a bunch of leaks in my MTT game which has resulted in some great success. From Preflop sizing to adjusting to villains opening range, TPE has been a blessing. With over thirty different professionals to choose from its impossible to find a style that doesn’t fit anyone’s game. warren karp: As you know TPE is one of our advertisers, how did you find out about it? and how long have you been using them? marc: My buddy was watching videos on TPE about two years ago after he saw an add on 2+2. I joined a year later when i decided to give up playing sitngoes and give tournaments a shot. warren karp: So you specialize in both, is there one you prefer over the other? marc: MTTS. Playing Sitngoes is a brutal grind. I remember 20 tabling Double or nothings in my pajamas just trying to make rent. All i needed was a 3% roi and than with the added rakeback i could hit my monthly goal. SharkScope helped me track this allowing me to know exactly what i was making per hour. I love mtts though and will never go back. warren karp: So you started watching Videos and you’re obviously a quick study, when did you start making videos for them and become a coach/mentor? 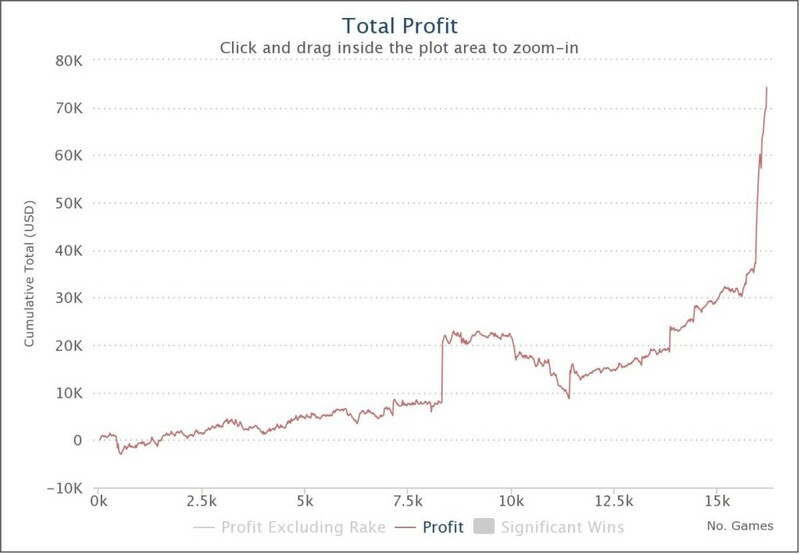 marc: I was a member for around 6 months before i met Casey Jarzabek (aka Bigdogpckt5s) who took a look at my SharkScope graph on Pokerstars, and asked me to do a DON series for TPE. After my first series, he quickly talked me into playing mtts. I started watching all of the videos, taking bits and pieces from each pro to improve my game. I never looked back to sitngoes after starting mtts and TPE was the reason for this change. marc: SharkScope makes the game easier to beat. Anytime you have added information on your opponents you are at a massive advantage. Having the ability to filter someone’s stats per buy in is a massive tool in reading a player’s ability. It was also very important for me to track my own results and SS made that easier. I literally know what my hourly is in a turbo/non turbo for every buy in I play. Frankly, not using SS or TPE is a massive leak in a player’s game. marc: I would be lying if i said i didn’t wake up every morning and check SharkScope to see if I am still number 1. I want to be the best in the world and this is a small step towards that goal. Staying number 1 will not be an easy task as I am running incredibly above EV for the first 2.5 months and there are a ton of great players on the Merge network. Having said that, I work very hard so I expect results. A fellow TPE pro, Daryl Jace, has been coaching me this year and has had a massive impact on my game. With his help, I’m staying motivated and plan on staying a top this list. warren karp: I also notice that many of the pros on TPE play Live Casino MTTs, do you also transition into offline play? marc: Oh yes, i take a two month “vacation” to Las Vegas every year for the World Series. The live grind is brutally slow, but i enjoy interacting with people and chasing the dream of winning a bracelet. warren karp: Having played many live tournaments I’ve noticed that players very readily tell others their online screen name. Do you ever use iScope to get their stats? marc: I have not used iScope but any application that allows me added information would be very useful. How does it work? marc: Online- I want to stay number one on the Sharkscope leaderboard. My goal for the World Series is simple, ship a bracelet for the TPE nation! Here at PokerMD we’ve been monitoring SharkScope’s Leader-boards and one name has stood out atop the SNG profit list with winnings of over 1 million dollars at the time of this interview. Dan Coleman alias mrGR33N13 was kind enough to take the time to go Heads-Up and allow me to interview him. He was very gracious and held nothing back. Below are the contents of that interview. PokerMD: So here we go, let’s start with your screen name does it have any significance? PokerMD: and how long have you had it? dan: A while, since 2008. PokerMD: same on other sites or just stars? PokerMD: Is FT getting back to what it was? dan: No, the action is really slow there. I’ve had times where I forgot I was registered for heads up lobbies on there and left my apartment, came back, and still hadn’t got sat. dan: Ya definitely, thankfully I’ve only done that a few times. dan: I started playing online when I was 13 right after moneymaker won the main event, so this was 2003, I played on a site called JetSet Poker, I remember being one of the railbirds begging at a 1/2NL table for 25cent transfers so I could play a .01/.02$ game. PokerMD: Wow I’d say you’ve come a long way….were you old enough in 2003 to be playing? dan: No, was only 13 years old. I think for my 14th birthday I was able to convince my mom to deposit 100$ for me. I lost it within 2 days. dan: Haha, for sure not. I definitely had a propensity to gamble. PokerMD: Ok so even in 2008 you were barely 18….had you been to B & M casinos to play? It was my first time playing live poker and I didnt do very well. PokerMD: So you started in MTTs what was the progression that led you to HU? dan: I guess I started in heads up sngs actually. Me and my friend shared an account on a sports-betting site and when we didn’t have action on a sports game, I would take the money to the poker tables and I more often than not found myself winding up at the heads up sngs tables. This was when I was around 16.
dan: Ya, gambled on everything to be honest. dan: I would run up money playing sngs then usually bust my account playing 5ks underolled. So I eventually switched to just MTTs around 2008. But that didn’t go well as I didn’t have the patience for them. dan: Ya around the age of 17, I would constantly run up bankrolls and then play 5000$ heads up sngs and go on a bad streak and lose all my money. PokerMD: so it wasn’t all roses to start out? PokerMD: sounds like my career LOL so it became a conscious decision to play strictly SNGs? PokerMD: and never HU cash games? dan: ya ive played lots of heads up cash games, i usually got beat up pretty badly in them in the beginning but I eventually got pretty good to where I could hold my own. I was never world class in them though. dan: Taking everything into account, I believe I’m the best in the world at them. PokerMD: And you have the ranking to back that up….so before 2013 what was your best and worst years and amounts if you don’t mind my asking? dan: I always struggled to capitalize on my skill set in poker up until this year. I had the talent but terrible intangibles that led me to always fail to make money. In 2010 I had a good year where I won a lot of money, but apart from that, never much success. PokerMD: so what was the catalyst…what turned it around this year? dan: I think I’m just a bit more mature and I have a smarter approach to the game, before I felt like I deserved more then I had and I would try and just battle the best and show them how good I was, and that was more important to me then making money, nowadays, i just try and do what’s in my best interest for making money. PokerMD: a good strategy. So do you sit and wait for a player to join you or do you take on others that are waiting? dan: I’m always sitting waiting for action. There are some regs that I share lobbies with because its mutually beneficial for us to do so. PokerMD: now I’ve seen you have 25000 swings some days…considering your .01/.02 start do those swings effect you in anyway…upswing or downswing? dan: When I play heads up sngs the swings do effect me. I grind a lot, some days it’s all I do. My results are tied to myself worth as a result. When I am winning I feel good about myself, the losing days I feel terrible. Fortunately, about 9 out of 10 days are winning days. Funny thing is, when I venture into cash games when they’re is a juicy spot around, I don’t let swings affect me at all. There were days earlier this year when I was playing 500 1k cap and lost a couple hundred thousand in a 2 day period and I wasn’t bothered by it. I can go into big games with the mindset that whatever happens, I know it’s a good game and I’ll be accepting of the outcome. PokerMD: So when did you join SharkScope? dan: I’ve used SharkScope since 2007. It is a pretty important tool for grinding sngs. PokerMD: Tell me in which way? dan: For me, it was something that helped me track and analyze my results. As well as give me motivation to succeed as my results were made public. PokerMD: and if a screen name sits down that you’ve never played before do you search the player? dan: No, but I used to back when I first started grinding when I was playing 50$ sngs. Nowadays I just do use it to break down my own results. My game is pretty evolved at this point so if someone chooses to sit down vs me, they are going to be an underdog and I am just going to try and breakdown there leaks as quickly as I can and do my best to exploit them. dan: Most important things I can credit my success too is just having an insatiable appetite to be the best at heads up sngs. A lot of regs get stuck at certain stake levels, there is a lot of guys who will never progress past 200s 300s or 500s. You really need to believe you belong at higher stakes to make it there. If you truly believe you belong there, you will do what’s necessary to get there. PokerMD: A great answer…I have 1 more question. Did you ever give your mom back the $100? PokerMD: LOL….Ok well thanks for your time, continued success and stay atop our leader-boards. Disclaimer: PokerMD.com does not condone any views or activities described by interviewees.